A massive building project is taking place at the old Joliet Arsenal in Elwood, Illinois. The arsenal is being converted into the Deer Run Industrial Park, and houses the national distribution facilities for a major department store. Two buildings there house 3.4 million square feet (315,860 m2) of warehouse space for the store. 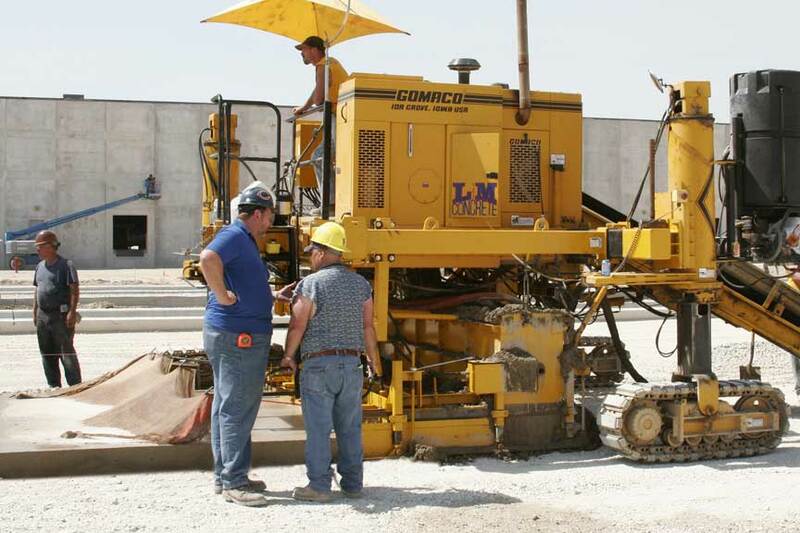 L&M Concrete, based out of Elwood, Illinois, was the curb and gutter contractor on the project, and used their GOMACO GT-3600 to slipform 31,000 feet (9449 m) of high-back curb and gutter. Another contractor had been hired to pave approximately 20,000 feet (6096 m) of dolly pad for the semi-truck trailers to sit on between loading and transporting. The contract fell through and left the development coordinators looking for a replacement. They turned to L&M and hoped they’d have an answer to pave the 10 foot (3 m) wide, eight inch (203 mm) thick pad. GOMACO offers a 10 foot (3 m) wide centermount mold kit. 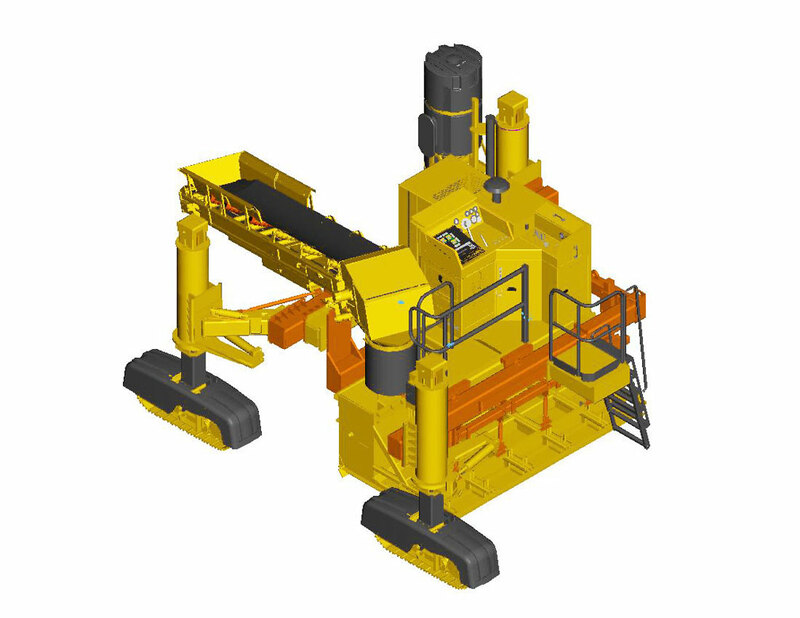 Cheney, Finkbiner and GOMACO engineers worked together to customize the kit to fit the project requirements. They determined early on that Cheney wanted to use the conveyor with a closed-front mold instead of dumping directly on the ground in front of the GT-3600. 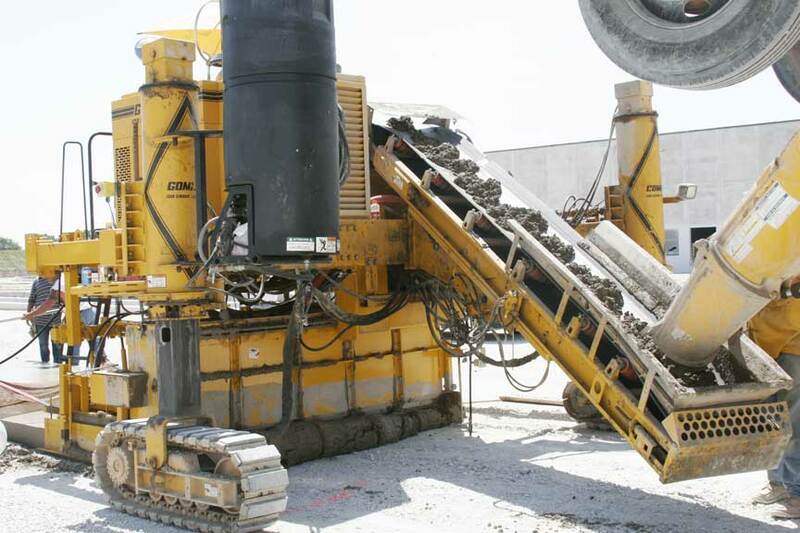 The mold is equipped with extra vibration and an auger that moves the concrete across the width of the pad. 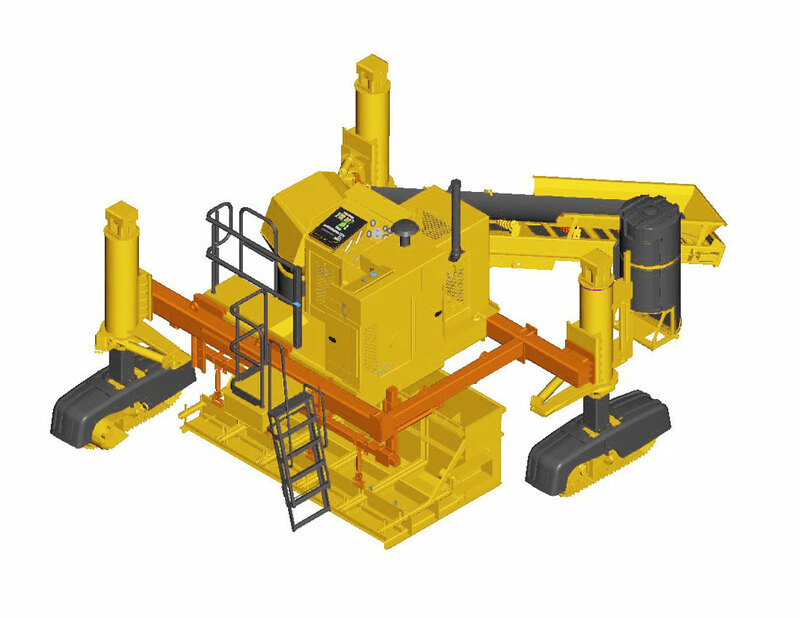 The mold system connects to the GT-3600 with added framework sections that include extensions for the three tracks so they can be properly placed for project requirements. Production rates were phenomenal. Their best day’s production saw them slipforming 530 cubic yards (405 m3) of concrete in seven hour’s time. 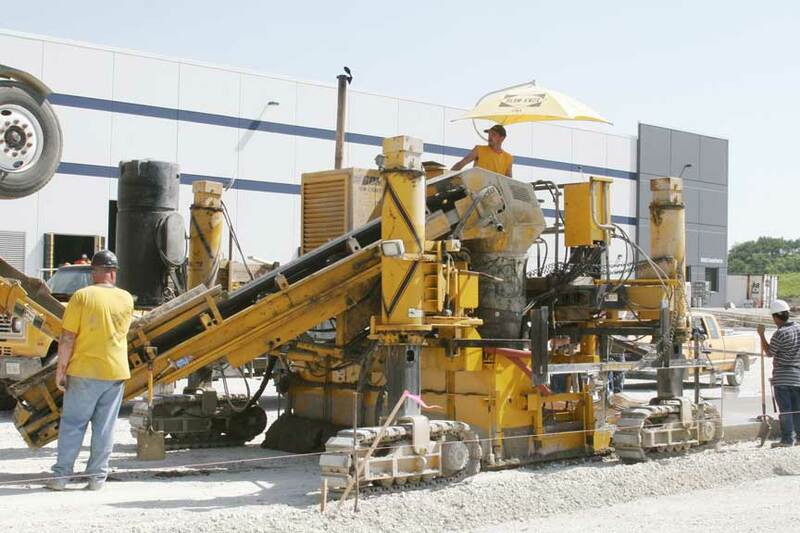 The GT-3600 was moving so fast that an extra concrete supplier had to be brought in. At times the slipforming operation was moving along so well that eight cubic yard (6.1 m3) ready-mix trucks were being unloaded in under four minutes. The GT-3600 put such a nice finish on the final concrete pad that L&M’s finishers had very little to do. They ran a bull-float over it and a light broom finish. Finishers spent most of their time putting in expansion joints every 100 feet (30.5 m). 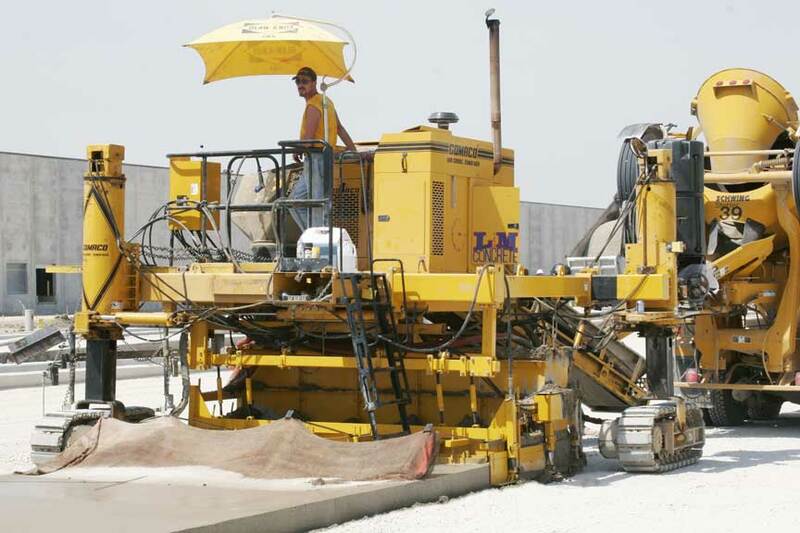 Cheney started L&M Concrete in 1982 specializing in patios and driveways. His focus soon shifted to city sidewalks and smaller curb and gutter projects. His company grew from there. Within a couple of years, they were handforming approximately 200,000 feet (60,960 m) of curb and gutter per year. In 1990, it was time to get a slipform curb and gutter paver, they turned to GOMACO and the GT-3600. They’ve been running GT-3600s ever since. Cheney, his step-son and GT-3600 operator Ricky Bishop, and other members of his team have been regular attendees at GOMACO University for several seasons. Each time they attend, according to Cheney, they learn something new and a better or more efficient way to operate their machine. Select any photo for a closer view. A GT-3600 slipforms 10 foot (3 m) wide dolly pads at a distribution facility. The dolly pads keep the landing gear of the truck trailers from sinking into the surface the trucks are parked on while the trailers wait to be loaded or transported. From far left, Radar Bazan, Finkbiner’s mechanic, Les Cheney, L&M Concrete owner, Cheney and L&M friend, “Coach,” and GT-3600 operator Ricky Bishop, at work on the project. Cheney says his new mold has already brought in extra projects and more work for his business. The undermounted mold on the GT-3600 is built with a “frame around a frame” concept, which is illustrated by the orange pieces of framework in these drawings.